We’d love your help. Let us know what’s wrong with this preview of Settle the Score by Alex Morgan. From soccer star, Olympic gold medalist, and bestselling author Alex Morgan comes the sixth book in an empowering and fun-filled middle grade series about believing in yourself and working as a team. Devin is finally catching her stride with the winter soccer league, and as the championships approach, Devin and Jessi’s team has a real shot at coming out on top! 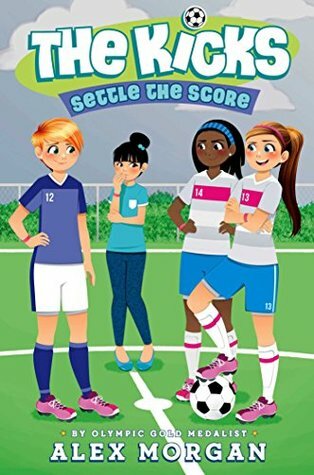 Only, Zoe’s From soccer star, Olympic gold medalist, and bestselling author Alex Morgan comes the sixth book in an empowering and fun-filled middle grade series about believing in yourself and working as a team. To ask other readers questions about Settle the Score, please sign up. Some of the lessons in this one might be a little heavy handed....but sweet never the less. Bravo Alex! i love your books.the only two i've read is win or lose,&,settle the score. I read this entire series when I was in middle school. I enjoyed it enough to continue to purchase the books after each new installment came out. The plot for each book was something new, and I enjoyed that it wasn't just the same old story revolving around the same climax in every book. What I didn't enjoy was the length. The books were way too short for my liking. I need length, because I honestly whipped through the series in one sitting. The LEXILE is very low, and there is little to no sophi I read this entire series when I was in middle school. I enjoyed it enough to continue to purchase the books after each new installment came out. What I didn't enjoy was the length. The books were way too short for my liking. I need length, because I honestly whipped through the series in one sitting. The LEXILE is very low, and there is little to no sophisticated vocabulary throughout the books. I was a fairly advanced reader for my age at the time, and it was like reading a picture book. Librarian Note: There is more than one author in the GoodReads database with this name. This is for Alex[3spaces]Morgan. An American Soccer Player (Forward/Striker) and an Olympic Medalist. Drafted first in the 2011 WPS Draft by the Western New York Flash. And now plays with the Portland Thorns FC.